Published September 6, 2016 By Anna T. This post may contain affiliate links. Regardless, I only recommend sites I've researched and/or used and trust. One of the most effective ways you can monetize your blog is with affiliate marketing. If you're not familiar with affiliate marketing, it's basically recommending various products and services to your readers and then receiving a commission if someone signs up for, or purchases, what you recommend. It goes without saying, but this should be done honestly and you should only promote things you would use or buy yourself. You should also make sure your readers are aware of your affiliate relationships by using a disclosure at the top of your posts (similar to what you see on this blog). So how much can you earn using affiliates? Quite a bit, if you're doing it right! This blog earns thousands a month thanks to affiliate marketing. And Michelle Schroeder-Gardner of Making Sense of Cents earns about six figures a MONTH with her blog, with a large portion of that coming from affiliate marketing. Yes, six figures a month! You read that right. Blogging has been life-changing for me in terms of income, and I love inspiring you all with success stories showing that it can be done. 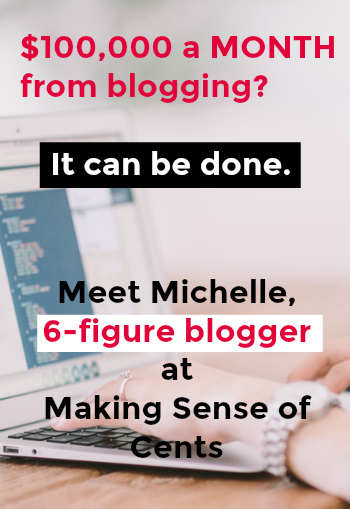 And Michelle is hands-down one of the most inspiring examples of blogging success I could possibly share with you! Can you tell us a little about your blogging journey? I started Making Sense of Cents in August of 2011, after reading Cosmopolitan magazine (yes, that magazine actually had a good section on personal finance that month!) that featured a personal finance website in one of their articles. I got hooked on that personal finance website (that website is DailyWorth) and everything just grew from there. I did not create my blog with the intention of earn a living – it was all just a hobby. At first, I blogged about things I was going through, such as my father passing, living a paycheck to paycheck lifestyle, and other personal topics that I have since deleted from my blog (I used to blog entirely anonymously – even with a fake name!). I then realized how much I loved blogging and realized that it was for me, so now I am a full-time blogger! It's funny how life can change so drastically. About how long did it take you to go from zero to six figures a year, and roughly what percentage of that comes from affiliate marketing? You can find all of my income reports here. Like I said above, I didn't start my blog with the intention of making money, so I never thought about it or even tried until almost a year later. I made around $1,000 a month the year after I started and now four years after that, I am making around $100,000 a month from my blog. Around $50,000 a month comes from affiliate marketing. On average, how many hours per week would you say you spend working on your blog? This is a hard question for me to answer. We travel full-time, so our weeks and schedule change all the time. In July, I hardly worked on my blog at all, but in August I've regularly been spending 12+ hours a day nearly every single day on it. I've been working so much because I'm trying to get ahead and right now I have pretty much all of my work done for a month and a half, so that is nice. Out all the ways there are to monetize a blog, what is it about affiliate marketing that you prefer — as compared to display ads and direct advertising? I prefer affiliate marketing over the other methods of making money blogging because it can feel quite passive. You can create just one blog post or social media post, and potentially earn money from it years down the line, as long as you maintain it and keep generating traffic to it. With affiliate marketing, I can enjoy life more and know that I am still able to earn a great living promoting products that I use and enjoy. Think about it this way: If you already enjoy a product, why not get paid to promote it? Do you think it's possible to do well with affiliate marketing even if you are getting less than 100,000 page views per month? Yes, for sure. Even when I had less than 100,000 page views per month, I was still earning money from affiliate marketing with very little work. It's all about effectively and efficiently promoting affiliate products to your following, which I teach in my Making Sense of Affiliate Marketing course. I receive around 400,000 page views a month and am earning around $50,000 a month from affiliate marketing. I know people with millions of monthly page views who are earning no where near the amount that I am – so that goes to show you that it's all about promoting affiliate products the correct way. What would you recommend a new blogger, with a very limited budget, try to invest in during their first few months if their ultimate goal is to do this full-time? I know that I'm promoting my own course, but I do think that the course is a great value for a new blogger. There are several new bloggers who are taking the course and have already made their first affiliate commission after just their first month of blogging. Making Sense of Affiliate Marketing is a great learning tool, even if you are a brand new blogger. By taking this course, you will start off blogging the correct way. You can learn from my affiliate marketing mistakes and learn the best ways to start making an income by being an affiliate. Through taking this course you are sure to grow a profitable blog quicker than the average blogger, as you’ll learn exactly what you need to know about affiliate marketing. Your success in blogging is such an inspiration, especially considering there are so many people who don't even realize it can be a career! Can you tell us what's next for you? Thanks for the interview, Michelle! I want to add that I can personally vouch for Michelle's eCourse if you want to check it out. I signed up for it near the beginning of August and finished it within about a week. August was very busy for me with the kids starting school so I didn't have a ton of time to strategize and do much with what I learned. However, I still earned almost $2,000 more from affiliate marketing than I normally do! This surprised me. I hope that number will keep increasing as I spend more time implementing Michelle's strategies. The course is very thorough and easy to understand. I think it's particularly helpful for new bloggers who want to earn money blogging and are feeling frustrated with their efforts through things like display advertising and direct ads. And even if you are already making money blogging and feel like you understand affiliate marketing, chances you'll still learn some new, effective strategies from this course (as I did). You also get access to a private Facebook group for bloggers that is super helpful! The course is $197, or you can do a payment plan for two months of $105 a month. Wow, that is amazing! We now have 2 kids in college and a 4th grader, so I need a second job where I can work from home. I would love to be able to make my blog so successful! Thanks for the interview. This is great. So I actually have wordpress already. Do you think even starting off blogging personally, life events, feeling blah blah would be ok?? I don’t have any major websites or own a company is why I am asking.. THANKS!! Well, whatever blog you start needs to have some type of focus. It would be hard to drive a lot of traffic to a blog that’s just more like a diary. There’s nothing wrong with blogs like that, but those kind are usually more hobbies or outlets for people. If you are wanting to make money with a blog and find affiliate opportunities, the blog would need to be centered around some topic that people regularly look for information on. Hope that helps!